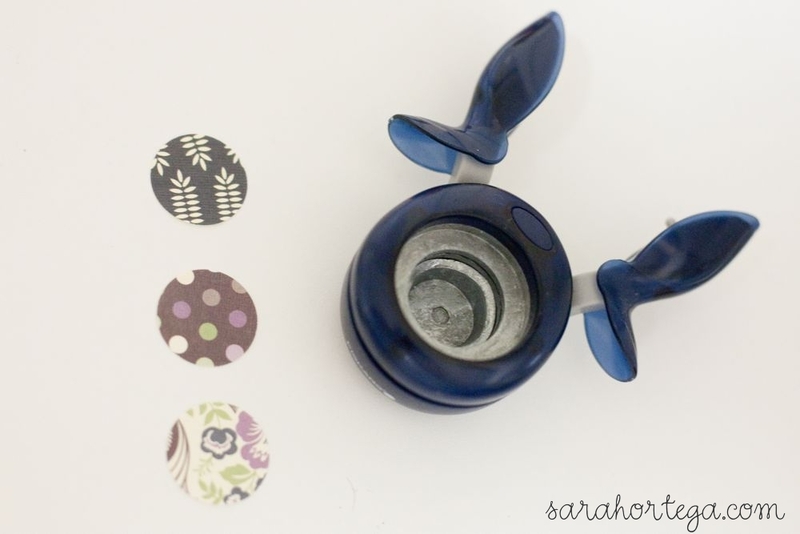 -Trace the marble onto the paper that you want to use. I used pages from an old US road map but you could use whatever you like. 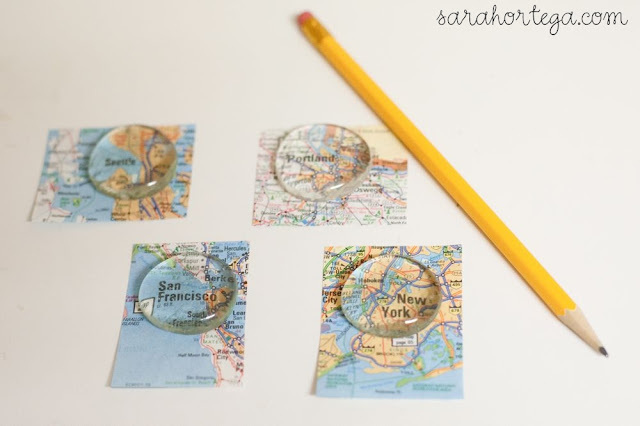 -Apply a thin layer of Mod Podge to the front of the paper and smooth it onto the glass marble. And voila, lovely map magnets! -Cut a circle the size of the inside of the bottle cap. My 1 inch circle punch happened to be a perfect fit. 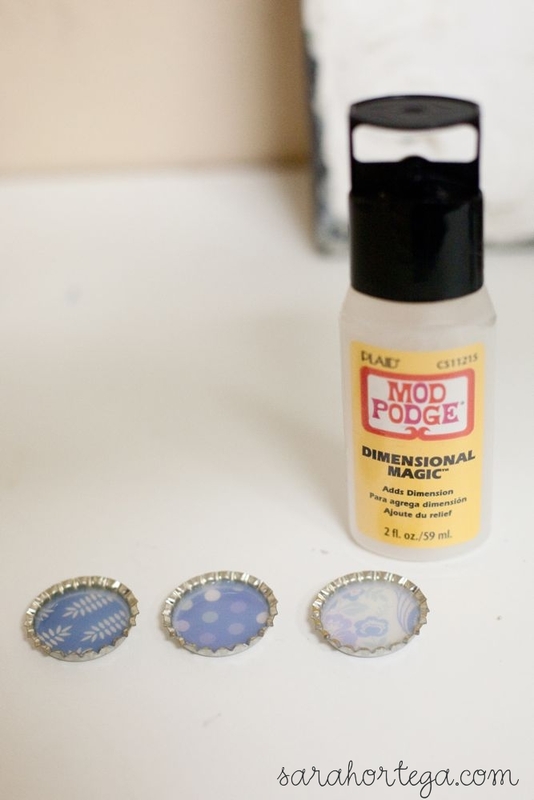 - Apply a thin layer of Mod Podge to the back of the paper and place it inside the bottle cap. 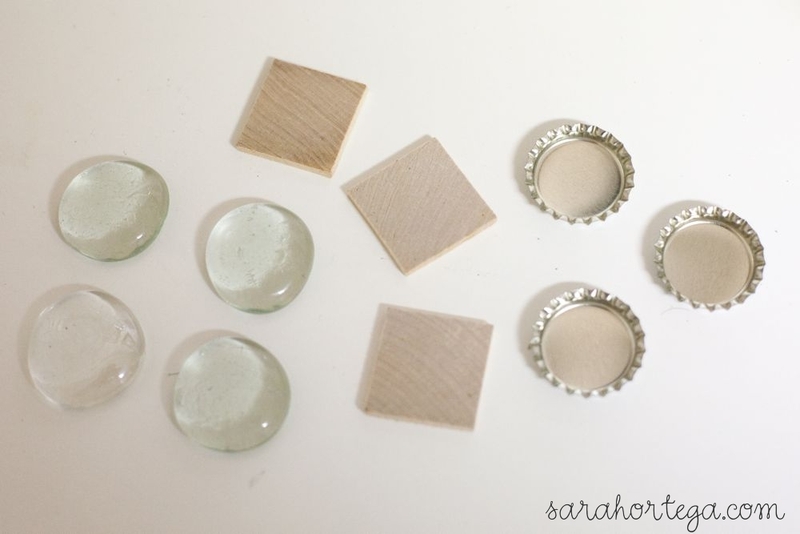 -Starting with the outside edges, fill the cap with dimensional craft glaze. It will be cloudy at first but it dries clear. Allow 24 hours to dry. Ta da! 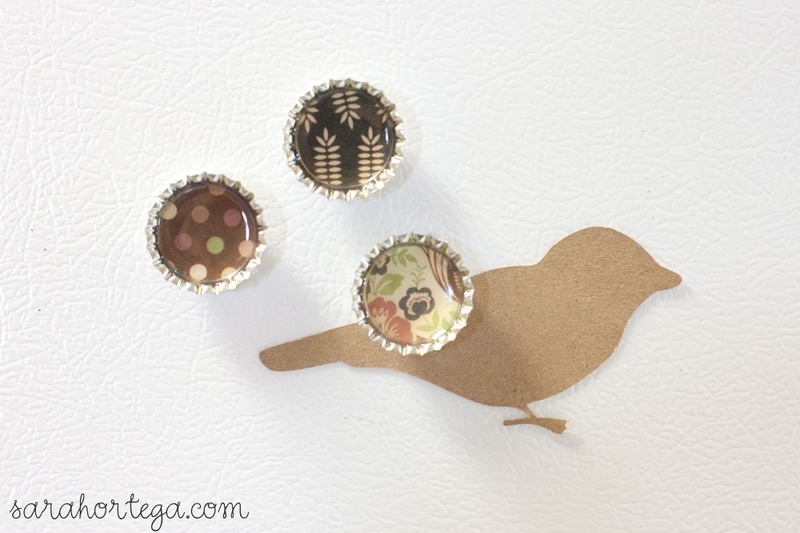 Colorful and cute bottle cap magnets. 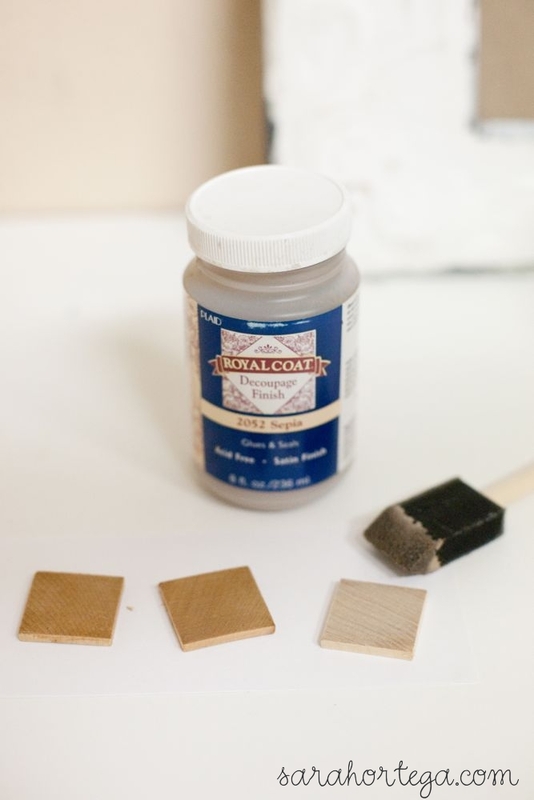 -You can leave the wooden squares unfinished or you can paint them, stain them or color them. For these squares I applied a coat of sepia decoupage. -Cover the square with self-adhesive lace and trim the edges. 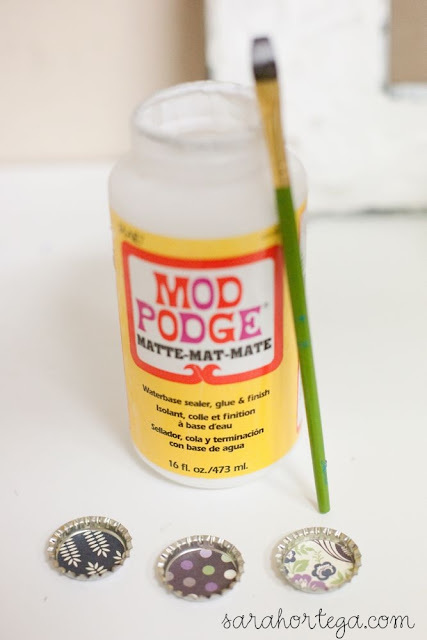 If you don't have sticky-back lace you could use Mod Podge to apply lace trim to the square. 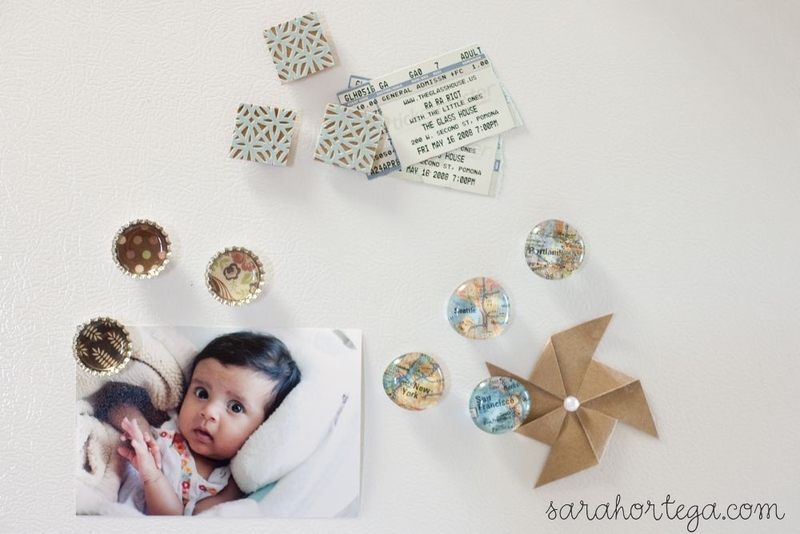 And there you have it, darling and unique wooden square magnets! Here are all three styles together. I love how they look on my fridge. What one is your favorite? These are great! Magnets are so much fun to make for anybody! I LIKE THEM VERY MUCH!!!!!!!!!!!!!!! my favorite are the one with glass marbles, it's really a nice idea! 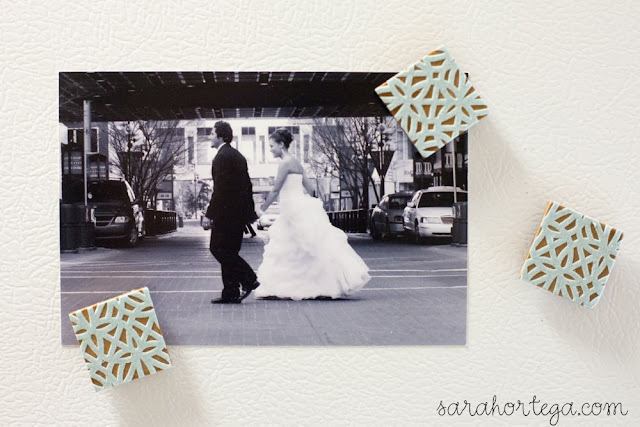 I found your blog through craftgawker and I'm glad I did! Your photos are beautiful. I can't wait to read more of your posts. great! i love these! 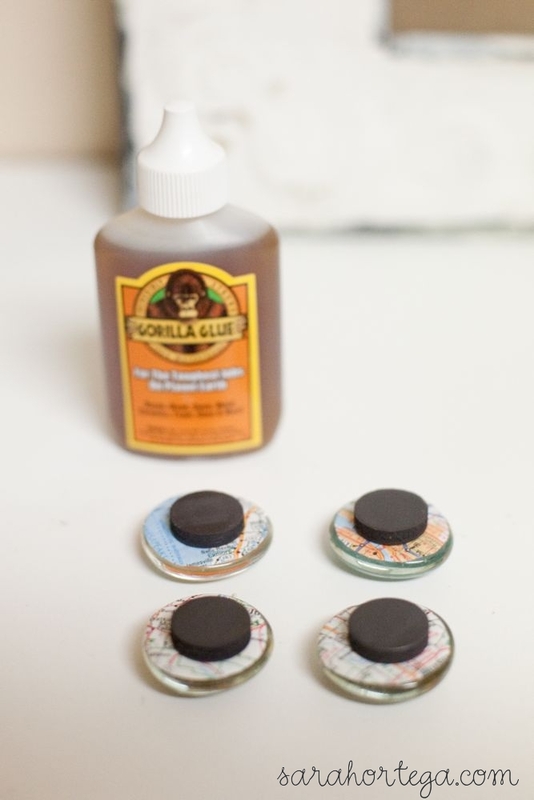 one thing i had a question about though... did you put a flat marbe on the bottle cap ones as well? 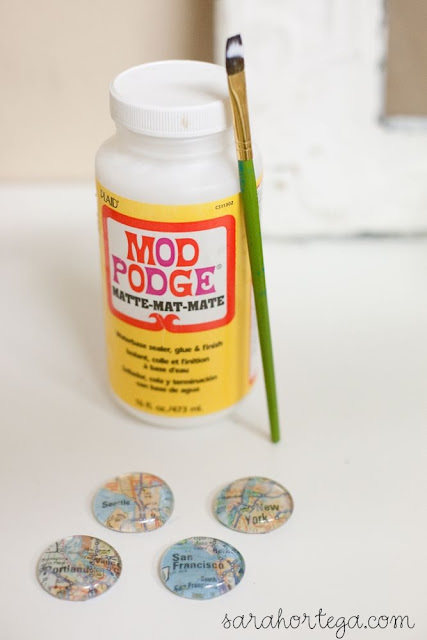 or just leave it as the mod podge paper? thanks for showing us how to do this!! How clever! I have all this lying around the house...can't wait to get started. Thank you! I love all of your DIY posts! 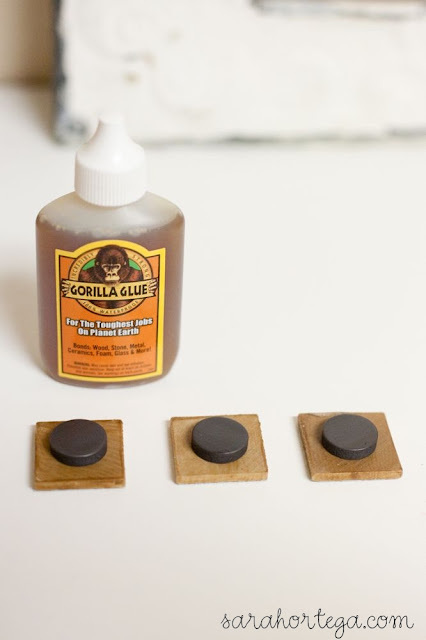 i have been looking at making magnets and pins, and this is a wonderful inspiration :) Do you think a hot glue gun would work instead of the Gorilla Glue for applying the magnet pieces? @Alyssa Thanks! I'm glad you enjoy the DIYs. 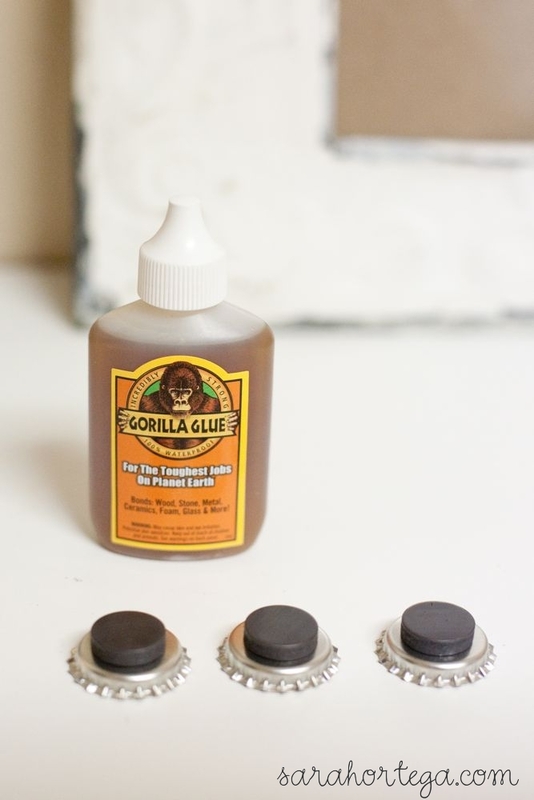 As for your question, hot glue can definitely work, it just won't provide as permanent a hold as Gorilla Glue. @Anonymous I didn't use a marble for the bottle cap magnets, just a layer of mod podge dimensional magic. Love this! It's just what I was looking for! I have these metal "strings" that hang on the wall used for hanging photos on with magnets. However, I didn't like the magnets they came with. I wanted something unique and customizable. This is exactly what I wanted. Thank you for sharing! I was wondering if you could share where you got the lace for this project. I can't find any that I like as much as what you used, or that really works well for this project. I would really appreciate it. I love your blog. 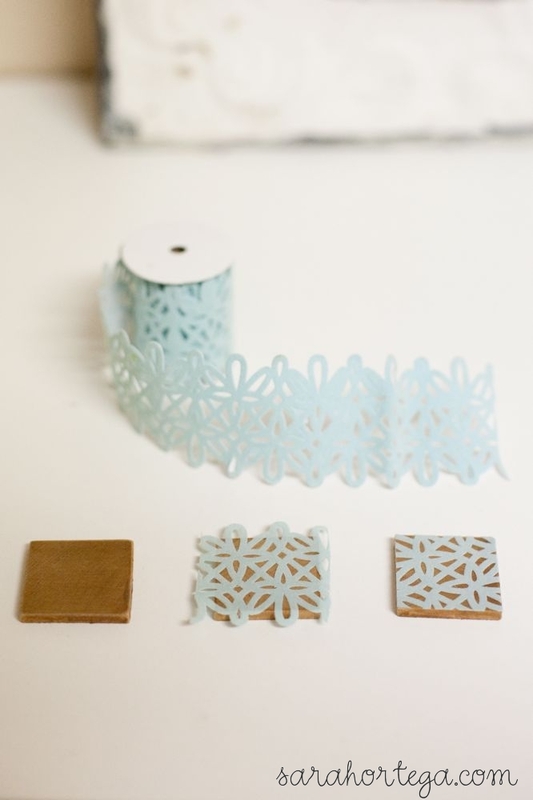 I actually found that lace tape at a scrapbook convention in Anaheim last year. I haven't seen it elsewhere in stores unfortunately. Perhaps you could try a scrapbooking store? Hope you find some! 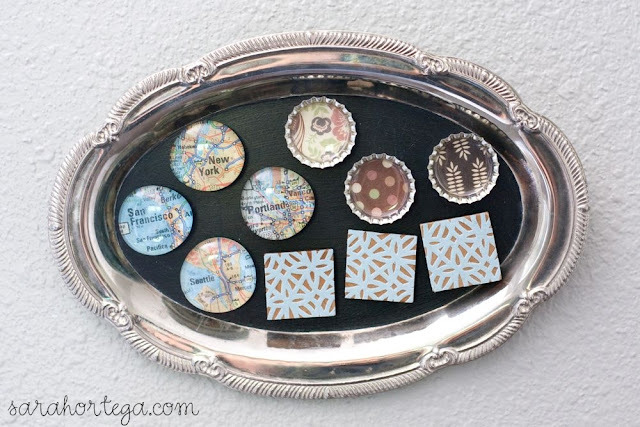 I love making these magnets; they are a great inexpensive gift for friends, teachers, etc. I have found that using the neodymium magnets (available on eBay) are the best because they are small and super, super strong. I also prefer to use epoxy over Modge Podge for the glass because it seals really well and is impenetrable. Great idea! 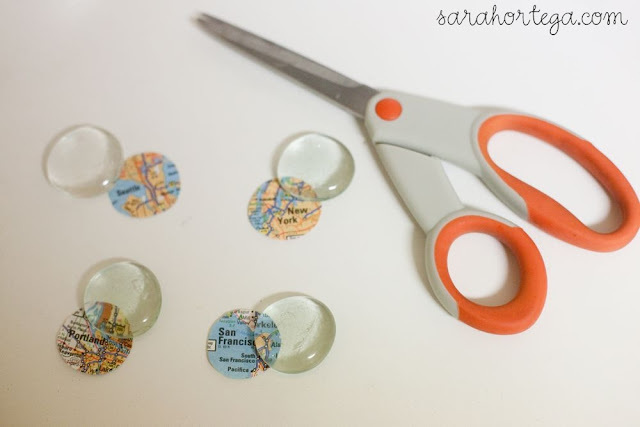 Sweet little project that will make great stocking stuffers! Thanks for sharing! 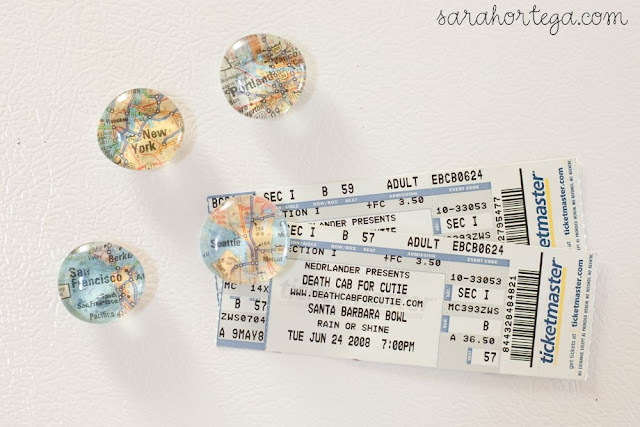 I know this is an old post, just wanted to say when I saw your concert tickets I got heart eyes! Love them!